Iconography is hot in design now. Here is an example from one of my websites. The above icons are colorful and have some depth to them, but you often see icons that are flat and monochrome. Here’s an example from urbangap.com/urban12/dicembre. I often see icons that are all gray. What is an icon and why are icons so popular? An icon is a graphic used as a symbol for a concept. The idea is that you look at the image and immediately know what it means. In practice, that doesn’t always happen and so the best use of icons is with companion text. An icon can be any file type, but if you can find a vector format, you’ll be able to import it into PowerPoint and edit it to your heart’s content. If you can find an EMF or WMF file, you can import it directly. However, these days, you’re more likely to find the icon in SVG format, which PowerPoint doesn’t support. If that’s what you have, you can use a workaround that I’ll explain below. Where can you find icons? One of the best sources I’ve found for icons is Iconfinder. As with images, you need to watch out for the license. While it sometimes works to provide attribution for a free image, it rarely works for an icon — the attribution would take up more space than the icon itself and be too distracting. Iconfinder is the only icon-specific site I know of that lets you both filter for license type and download a vector format for free. If you want to buy a set of icons, you can go almost anywhere. Use the Filter menu on the left side of the Iconfinder web page to specify Vector, Free (or not, if you have a budget), and No Link Back, as you see here. Use the Search box at the top to find the icon you want. When you see the results, click the Information icon at the lower-left to see the license and other information about the icon. Click the icon you want. Choose the file type you want. AI (Adobe Illustrator) files are only available with Iconfinder Pro, which starts at $9/month, but you can get PNG (a raster, bitmap format) and SVG for free if the icon is free. Type the keyword you want and from the down arrow at the end, choose Vector Graphics. Click the icon you want and check out its license. Almost everything is in the Public Domain (CC0 in Creative Commons terminology) so you don’t have to give attribution. Choose SVG and click the Free Download button. 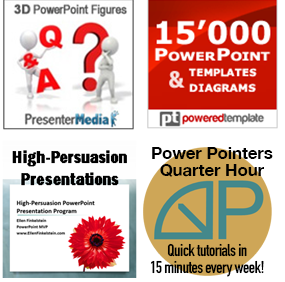 PowerPoint has excellent graphic tools for creating your own icons. I love to create people icons in PowerPoint. Here’s an example. I have a blog post on creating people icons here. Nowadays, I would probably make them flatter (without the gradient). Of course, you can create almost any type of icon, not just people. Here’s an icon of a tablet that I created with just 3 rounded rectangles. This is very easy to create. I used a light gray color that seems to be very popular now. Until PowerPoint supports SVG files, you’ll need a workaround and the best one I know of is to use Inkscape, a free vector drawing tool (somewhat like Adobe Illustrator). Choose the icon (yes, they use icons) for your operating system and then download and install it. Another option I’ve read about (but not tried recently) is to use OpenOffice.org’s Draw program. In both cases, you open the SVG and then export it (or save it) as WMF or EMF. If you want, you can play around with the tools in Inkscape; for example, you can change the color of the icon, but you can just leave it as is and do your editing in PowerPoint. I have an earlier post, “Create your own graphics and icons for PowerPoint: Part II–Creating line art from scratch” that describes this process, including how to import the WMF (or EMF) into PowerPoint and convert it to PowerPoint objects that you can edit. Once you create your icons, you can save them as bitmap images by selecting them, right-clicking, and choosing Save as Picture. Then you can use them in reports, web pages, social media posts, etc. hi Ellen, I was trying to make icon into PowerPoint 2010 by use various shape and combine shape tool. I just gather some more knowledge from this blog and hope to create more attractive icon in future. You said really true that icon is hot now. Thank you very much. That’s where I find have found some recently.